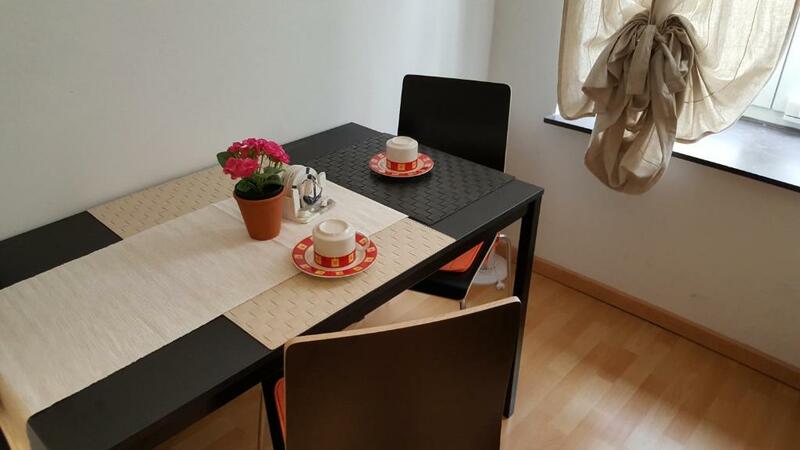 Hundred water Apartment nearby Viennas City Center + free wifi + free Vienna Coffee in Vienna has accommodations with free WiFi, an 8-minute walk from Kunst Haus Wien - Museum Hundertwasser and 0.9 miles from Vienna Prater Amusement Park. Guests staying at this apartment can use the fully equipped kitchen. This air-conditioned 1-bedroom apartment includes 1 bathroom equipped with a bath, a shower and free toiletries. The apartment has a playground. A bicycle rental service is available at Hundred water Apartment nearby Viennas City Center + free wifi + free Vienna Coffee. Messe Wien Exhibition and Congress Center is 1.5 miles from the accommodation. The nearest airport is Schwechat Airport, 11 miles from the property. When would you like to stay at Hundred water Apartment nearby Viennas City Center + free wifi + free Vienna Coffee? This apartment has a oven. This flat is for your own use. In a very good reachable location, even by walk just 10 min. to the city and to the most sightseeings. The main metro stations and the tram are just nearby. Comfortable doublebed, couch, dinning table, kitchen, fridge, espresso mashine with Viennese Coffee. The flat has a very pleasant atmosphere as it is well lighted and ventilated. It is always kept clean and well prepared to give you comfort and relaxation that you deserve. You can have your Viennese breakfast in the flat with free traditional Viennese coffee and a bakery as well as austrian sweets nearby. After a long and intensive tour in the city you can take a comfortable rest on the couch or a good sleep in the bed. You have access to all rooms and facilities with FREE WIFI, There are fresh towels, bedsheets, kitchen utensils and condiments, Coffee machine with free Viennese coffee and a mini oven are all available for your own use. We are both accessible by phone or email. We can offer you information about the flat and also about Vienna. We will do our best to make your stay memorable. If you wish we can also provide you with discount tickets for public transportation. In the flat there is an Info-folder, Map of Vienna with a plan of the nearby sights, restaurants, shops and places to visit. The city center can be reached in 10 min by walk. Few steps away there are 5 restaurants, a bakery, Tabacco Stand (where you can buy Tickets for Public Transportation) a huge shopping mall at Landstrasse Wien Mitte, a cinema, the direct Airport train CAT, Taxi, Car2Go (Vienna Car Rental per Min., ), Hauptbahnhof just 3 stations by train, Westbahnhof in 12 min. reachable by metro line U3, Stephansplatz, Schwedenplatz, Ring by walk just 10 min. 2 Stations from Prater (Fun and Recreation park). Public Transportation: All important public transportation are just arround the corner: Metrostation: U3 and U4 Landstrasse Wien Mitte, U1 Praterstern Tram: O and 1 "Radetzkyplatz"
House Rules Hundred water Apartment nearby Viennas City Center + free wifi + free Vienna Coffee takes special requests – add in the next step!